We decided to take the kids skiing in Breckenridge, Colo., this year since they have steadily been improving from our past several trips to Snowshoe, WV. 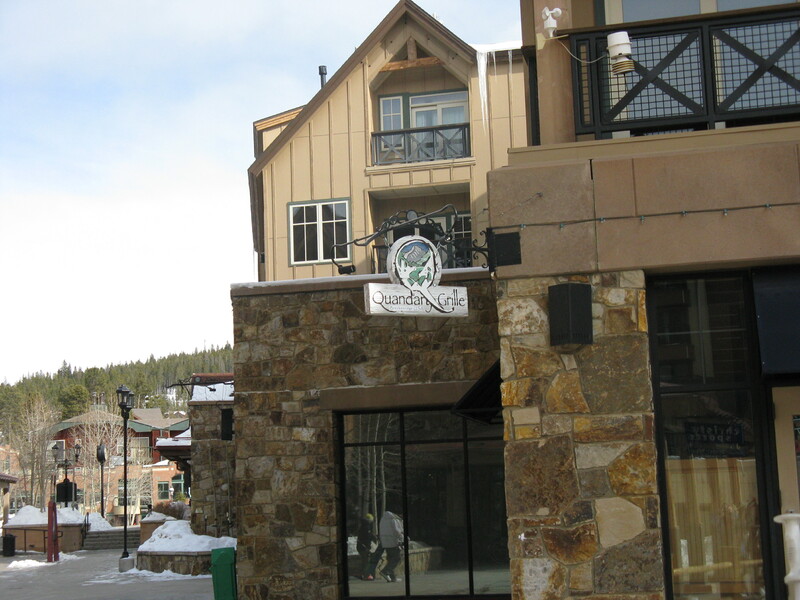 It works out great for me since I put up my skis about five years ago after being plowed down by a snow boarder – Breck just has much more to do in terms of shopping and eating and drinking. Which I did quite a bit of! 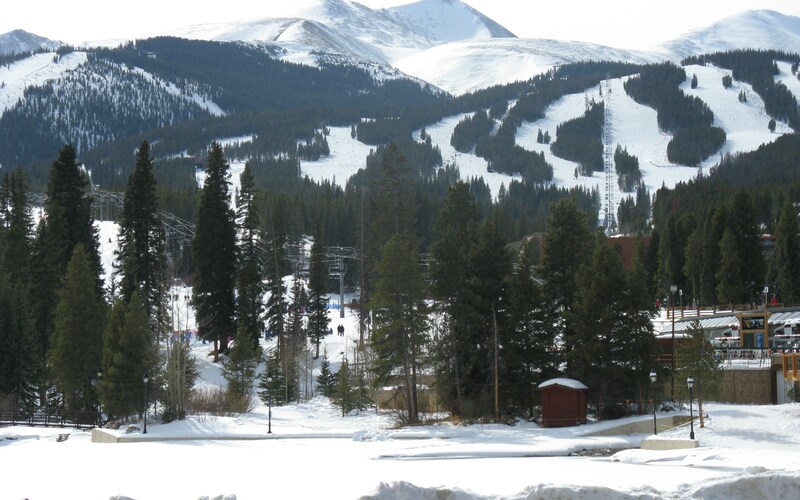 There were 15 of us who flew from Raleigh to take on Breckenridge during the Presidents’ Day holiday. 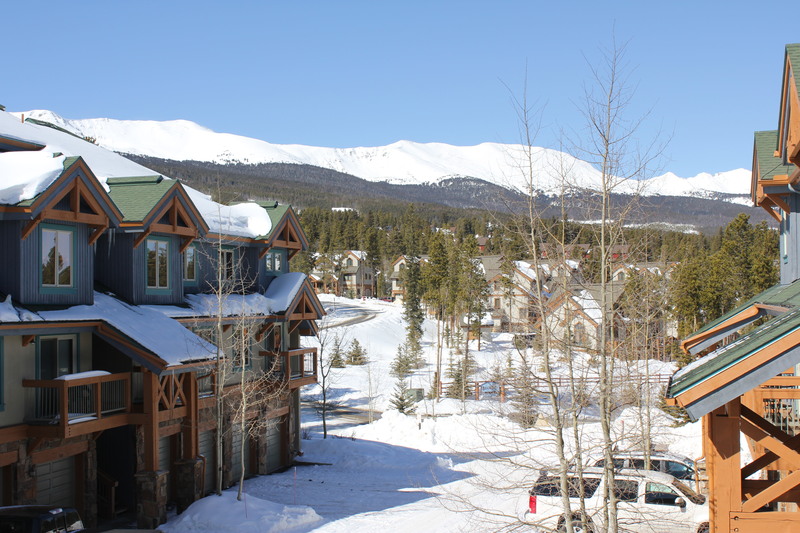 The kids (six of them) had Monday and Tuesday off from school, so the timing was good, despite Breck not having much snow this year. They all had fun on the slopes anyway, and while they were skiing, I had fun going into town and trying out various beers, appetizers and more. So, here are some of my favorites that I suggest you check out if you get a chance to visit, whether you need refreshments when you come down from the slopes or after a hard day of shopping. 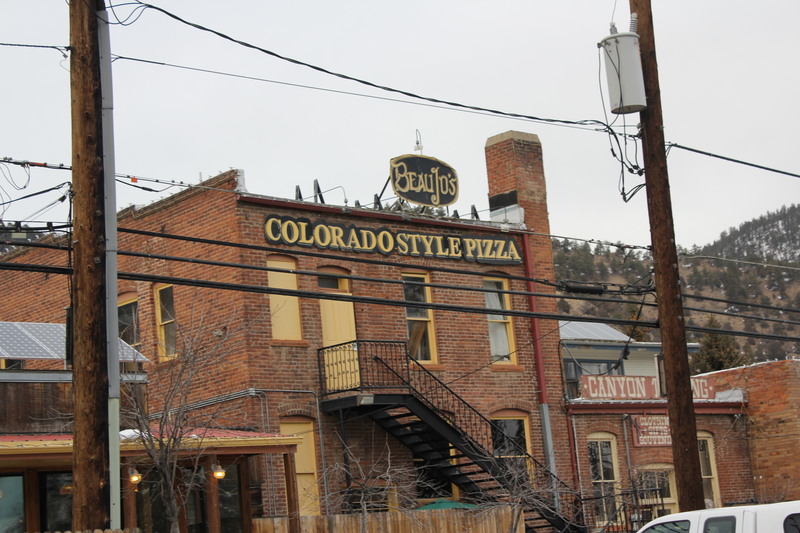 This great pizza parlor is not in Breckenridge (the one we visit is in Idaho Springs) but is a great stop when leaving Denver’s airport on the way to the resort. I’ve eaten here three times now and absolutely love the pizza. Garlic lovers, you will be happy, since there is plenty of it in the sauce! One thing I love one that I’ve never seen in other pizza places is that since the crusts are so big, the servers suggest you take some of the honey that’s on the table and pour it over the crust, no matter what type of pizza you get. Sounds a little strange, but so, so yummy. 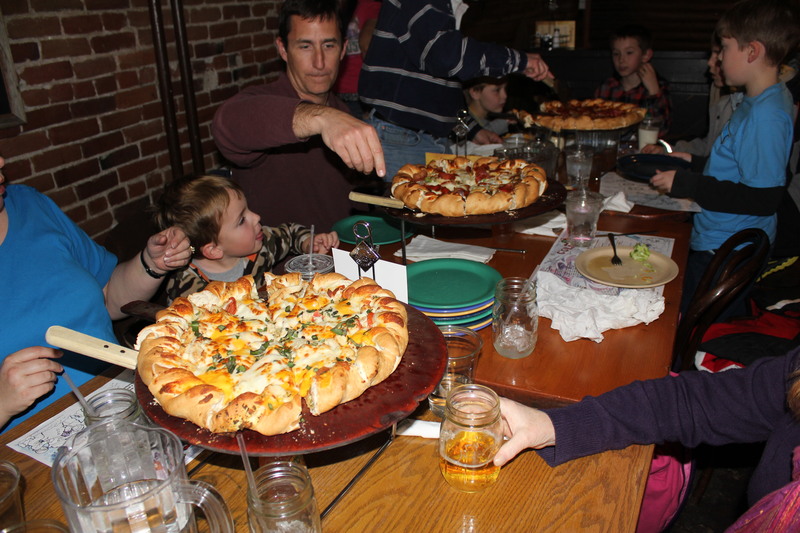 We got three pizzas on this visit to feed seven adults and six kids – the 3-pounder sausage combo, 3-pounder pesto chicken and the 5-pounder half pepperoni/half cheese. It was more than enough for all of us, and since we were staying in condos we took the leftovers with us. Great stuff! I love dive bars, ever since I worked at the OLD 42nd Street Oyster Bar back in the mid-1980s when I was in grad school at UNC. Jake’s wasn’t nearly as div-y as 42nd Street, but having been there on a previous visit with Brad, it was on my list of places to revisit. 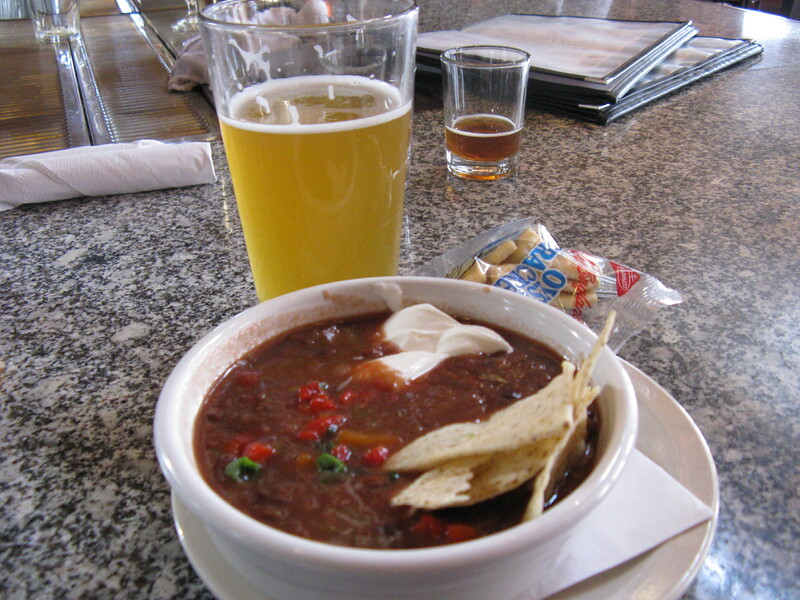 I had an Avalanche draft and a cup of the chili. The chili had ground beef, jalapenos, kidney beans and small diced potatoes. ($4.24 a cup) and was good and spicy with melted cheese on top. Yum. Steve the bartender took care of me and what appeared to be Breck locals, since many of them were paying tabs from the a few days before. The UNC/Clemson game was on, but I paid more attention to the others in the bar – they were much more entertaining. There was great music playing – Pearl Jam, Nine Inch Nails, etc. Steve got slammed – it went from a few people to no tables available. Happy hour specials each day. Probably wouldn’t take my kids there – too many “f bombs” and other bad words from some of the other customers. 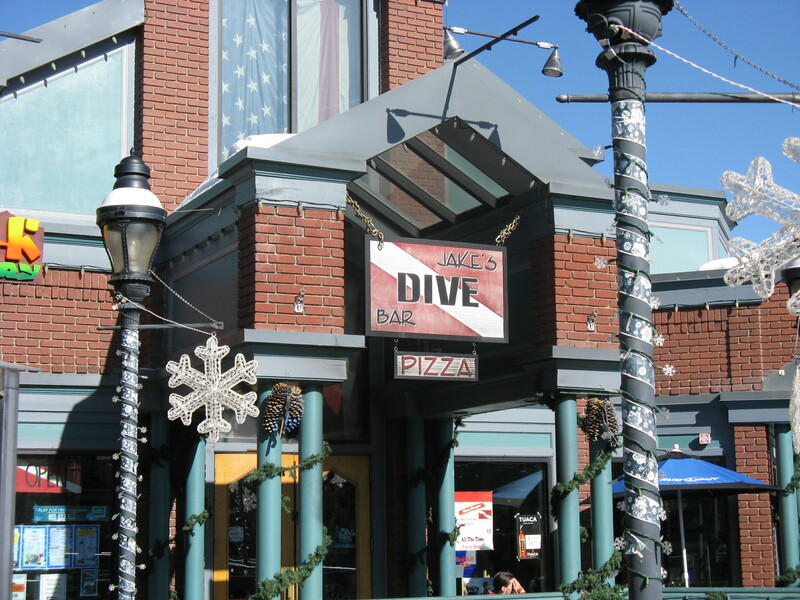 This seemed like another local hangout – Suzy the bartender knew most of the patrons by name and, like at Jake’s, some of them were allowed to carry overnight tabs. 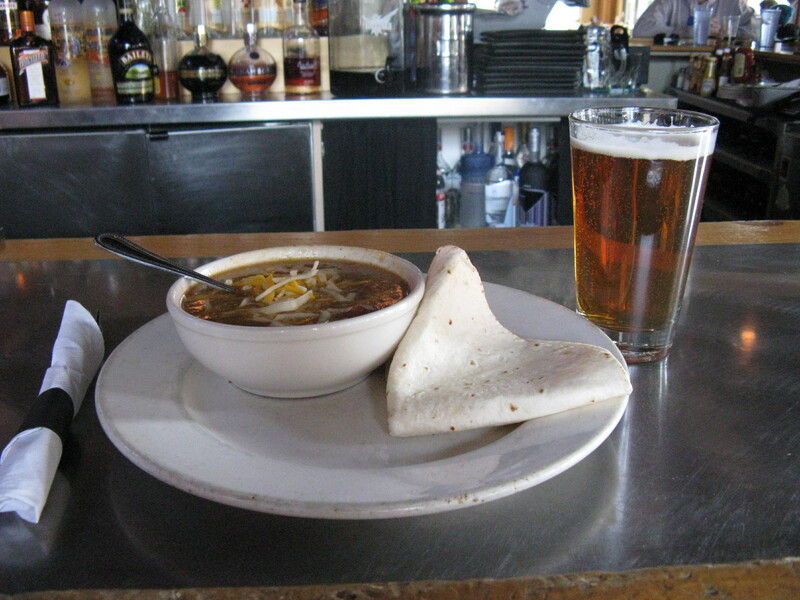 I stopped here for a late lunch and had a pint of Fat Tire and a bowl of the wonderful pork green chili ($5.99) that was topped with cheese and served with a warm tortilla. The chili was spicy with nice chunks of pork, tomatoes and green chilies. Great stuff – I would get this again. 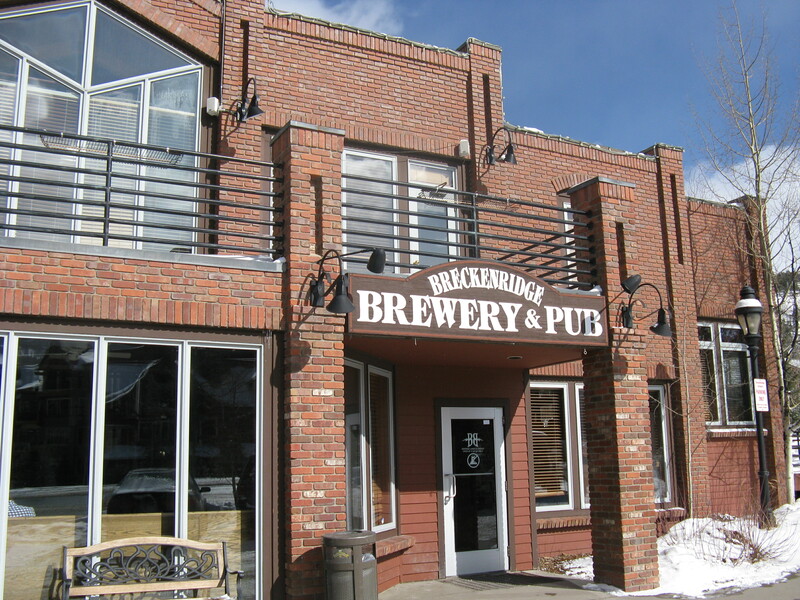 Once again, I had been here on a previous visit to Breck. It’s close to the base of Peak 9, where we had stayed on my first visit when I was learning to ski. From what I understand, the owner of this place also owns Jake’s Dive Bar. All I had here was an Avalanche Amber Ale draft ($4.00). Austin the bartender was nice, but it took a while for him to serve me since he was taking care of part of the dining room as well as the small bar in the front. The big bar in the back was closed when I was there – it opens sometime between 4:00 and 5:00. Judging by the full dining room at 3:30 in the afternoon, I would guess the food must be at least halfway decent, and I will go back and try it next visit. What a colorful and cheerful little place to enjoy a margarita! I had the Senor’s Rita ($7.00), which came with Hornitos, Patron Citronge and freshly squeezed (right in front of your eyes) lime and orange juices. 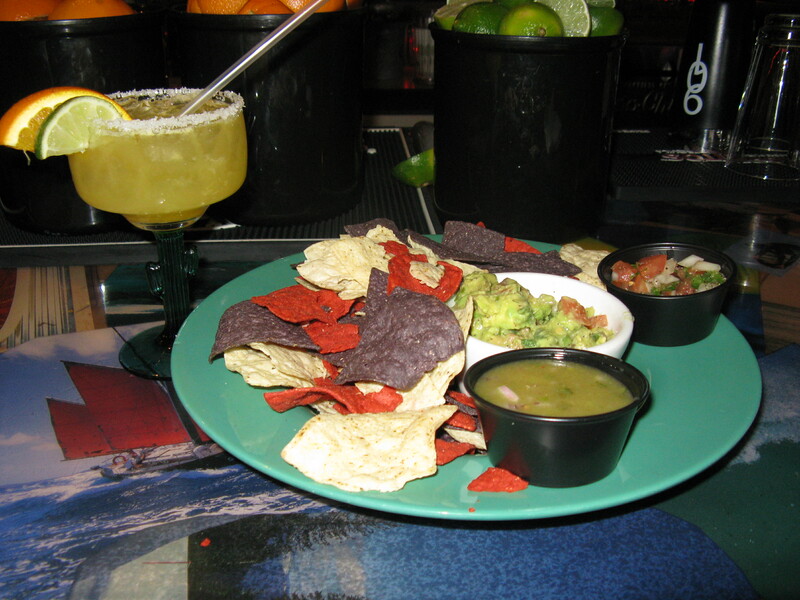 I also ordered the avocado dip ($6.00), which came with a choice of salsas. I opted for the salsa verde and the pico de gallo. Wow! The margarita was fantastic and refreshing, and the guacamole was nice and chunky (it did need some additional hot sauce and salt.) The salsas were good, especially the pico de gallo. Everything was fresh, fresh, fresh. 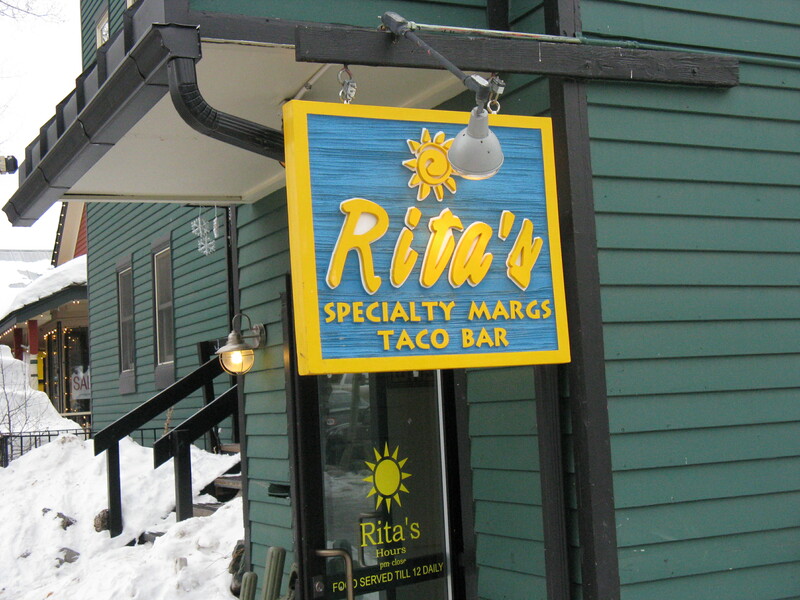 Ritas was cranking some 70s rock – Led Zeppelin, Lynyrd Skynyrd, etc. Great change of pace. After a hard day of shopping, I needed something warm and chocolate. I decided to stop in the Swiss Haven Restaurant, which is a fondue place, since I thought the hot chocolate might be a specialty. 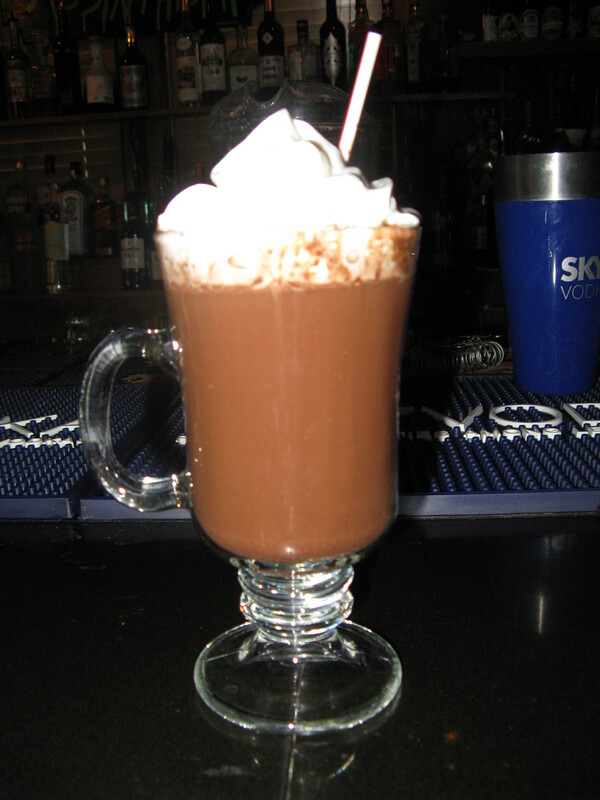 I wound up going downstairs to the Absinthe Bar, since I didn’t want to eat, and ordered hot chocolate with a shot of chocolate vodka. It took a little while to get my drink order straight since the bartender, whose native tongue was definitely not English, wasn’t sure what I wanted (hot chocolate with a shot of vodka and whipped cream – maybe since it wasn’t on the menu she was confused.) Anyway, she went and got a server from upstairs who made me an awesome drink ($7.00). 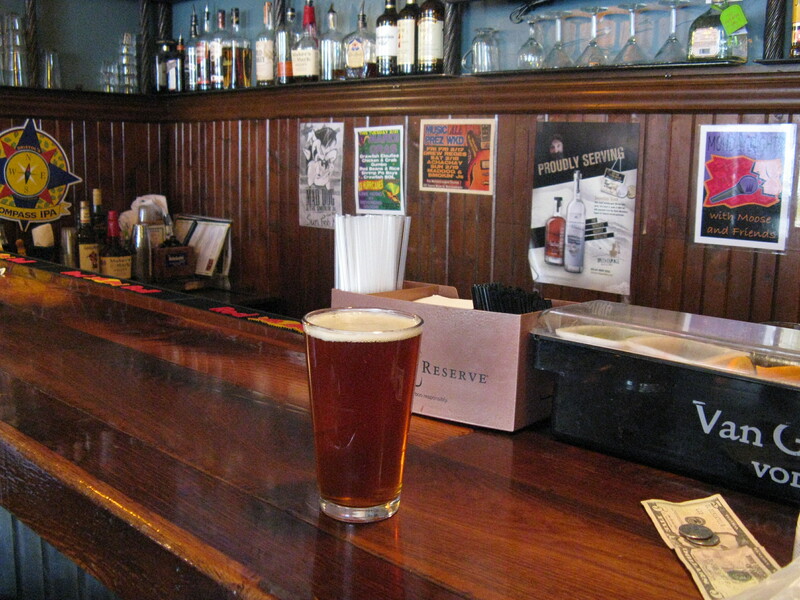 The bar is dark and paneled – a cozy place to escape a cold winter day! 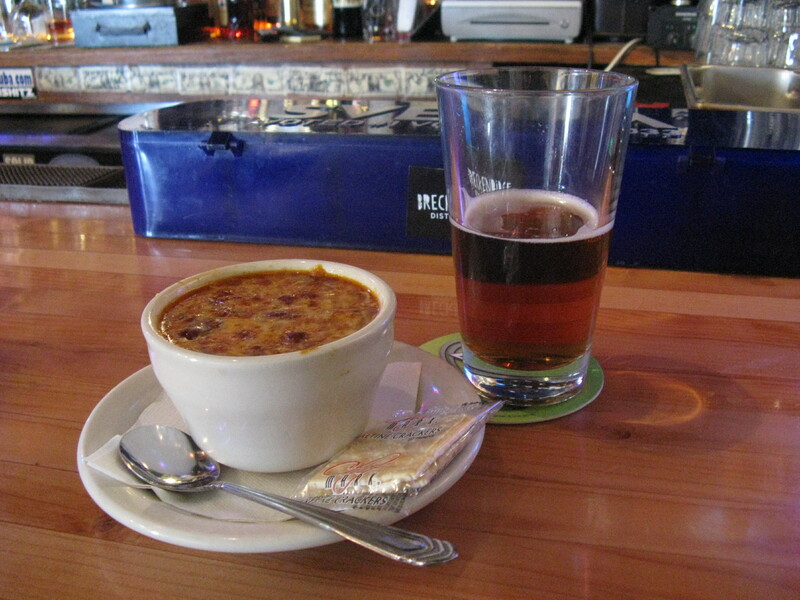 I won – my soup was delicious; Trudy’s was kind of bland until she added some salt, which helped tremendously. I can also recommend the buffalo chicken wings. So what does a massage parlor have to do with food or drink? Well, the water I got after my treatments was wonderful. OK, I know I’m stretching it, but I have to mention this place because I got one of the best massages ever. I opted for an hour-long, hot stone massage, followed by a 30-minute foot massage – heaven! Jin-E (I think that’s how you spell it) did an awesome job, and it’s the first time I’ve ever had anyone walk on my back (she was tiny and held on to a metal rod that hung from the ceiling.) Bliss! 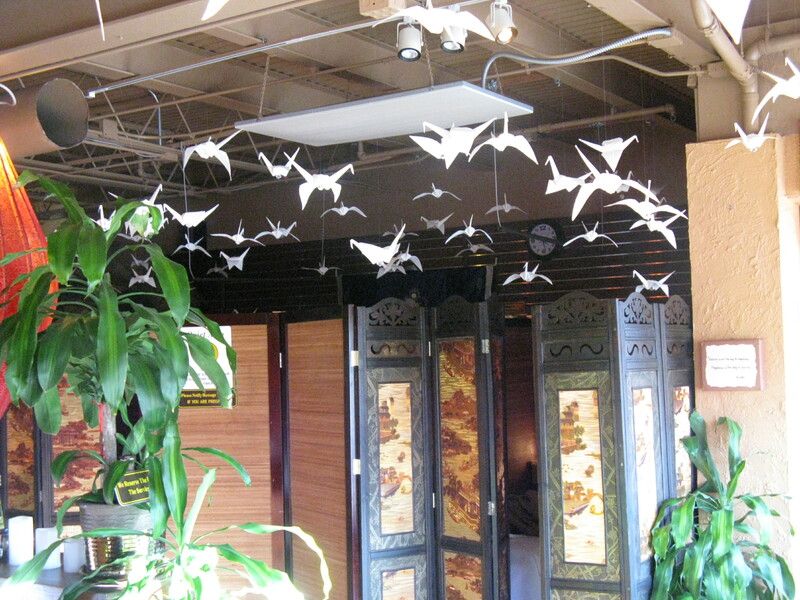 The interior of this place has some great origami cranes hanging from the ceiling, oriental screens that are beautiful, cheerful lanterns, etc. I will be back! 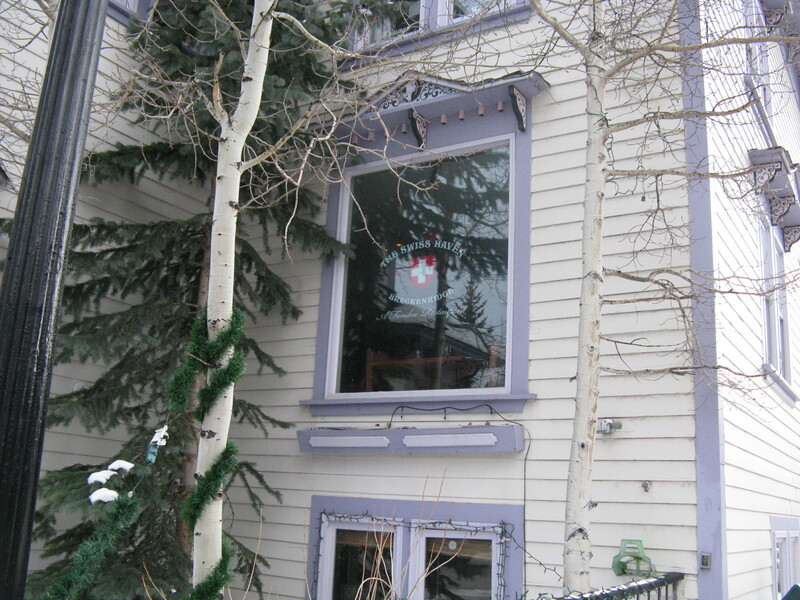 After my massage, I met Trudy (and later, Kris and Rusti) at Ullr’s. 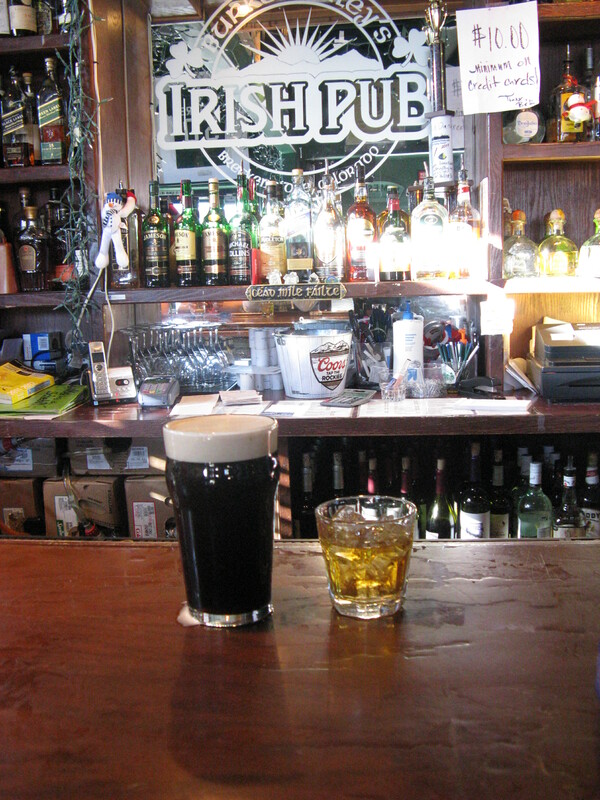 I started with a 1554 pint ($3.50). No chili on the menu, bummer. 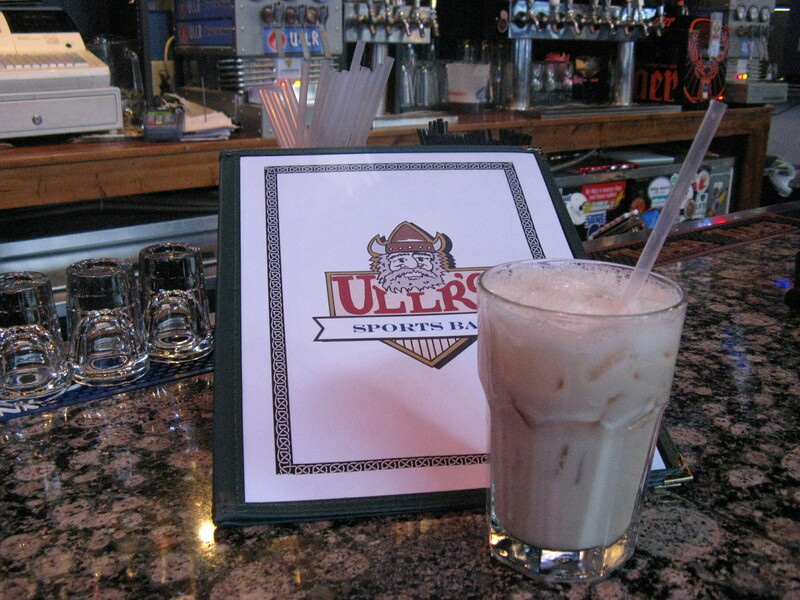 Ullr’s has two pool tables, an air hockey machine and a foosball table for the gamers out there or for the kids if you want to entertain them at lunch or early dinner. Trudy got a roasted toasted almond, made with Stoli Chocolat-Razberi for a different twist. Our bartender Justin took good care of us. 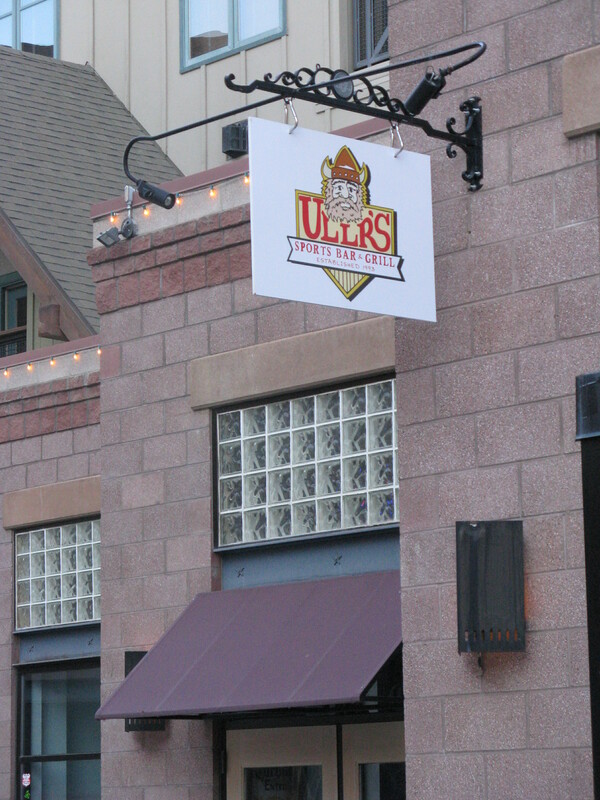 Ullr’s is also near the base of Peak 9. 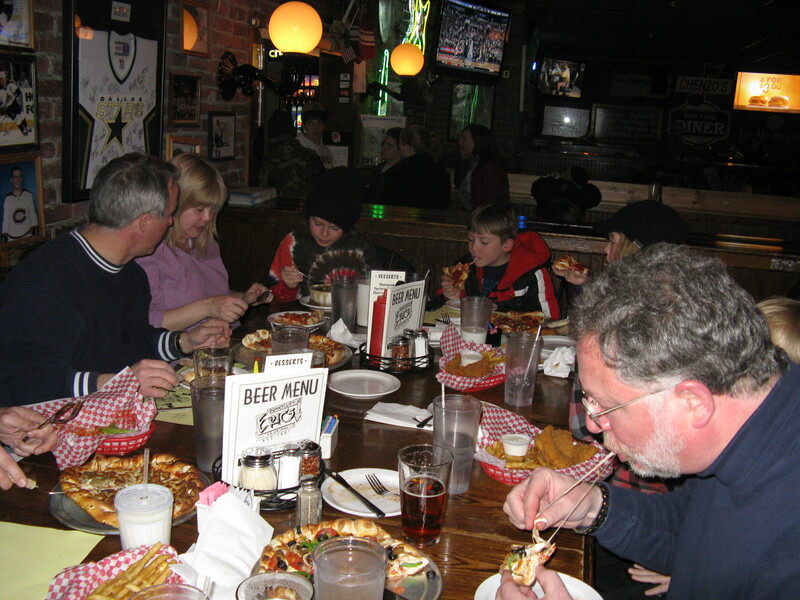 This is a Breckenridge tradition for our crowd – the pizzas are great! It is usually packed for lunch and dinner, so be prepared to wait for a table. Luckily, there a number of arcade games you can play while you are waiting. 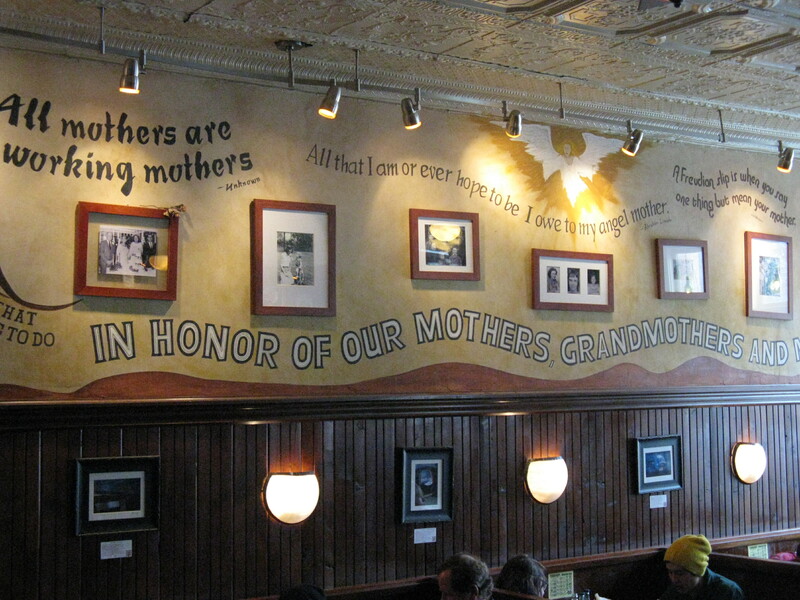 Or cozy up to the bar, where you can watch whatever games are on. On this visit I decided to get the Cobb salad, which was quite good – nice, fresh ingredients. And the pizza was great as always. 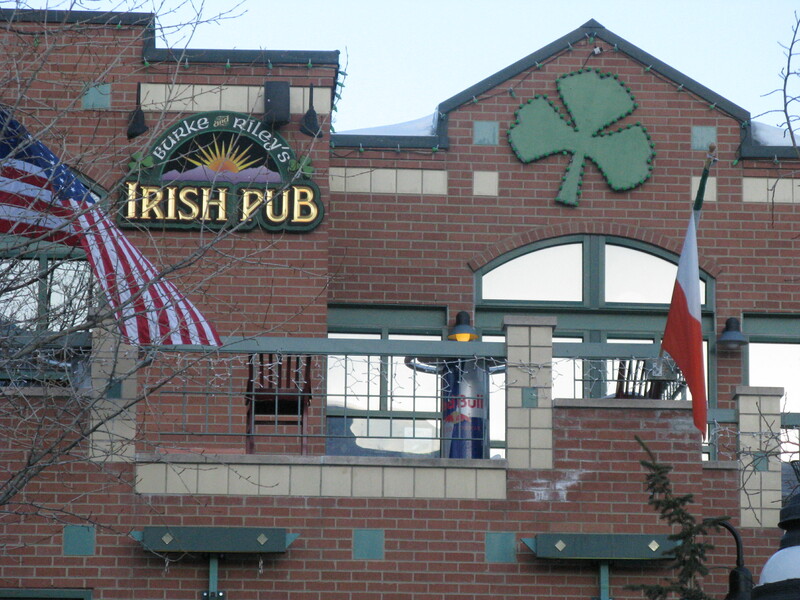 This place is definitely one of my “musts” to visit in Breck. I wish there had been more time to check out more places, and would love to hear your recommendations for our next trip! 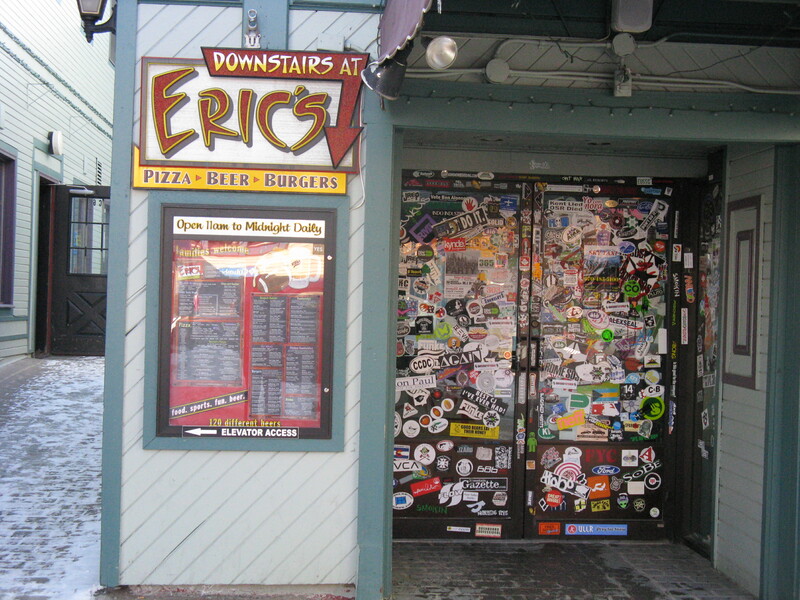 This entry was posted in Restaurant Reviews and tagged Absinthe Bar Breckenridge Colorado, Beau Jo's Pizza Idaho Springs Colorado, Breckenridge Brewery and Pub, Breckenridge Colorado pubs, Burke and Riley's Irish Pub Breckenridge Colorado, Downstairs at Eric's Breckenridge Colorado, eat drink and be merry, Feel Good Massage Breckenridge Colorado, Jake's Dive Bar Breckenridge Colorado, kel's cafe of all things food, Kelley Chisholm blog, Motherloaded Tavern Breckenridge Colorado, Quandary Grille Breckenridge Colorado, Rita's Specialty Margs & Taco Bar Breckenridge Colorado, Ullr's Sports Grill Breckenridge Colorado. Bookmark the permalink.